Remember the good old days when opening a laptop was a simple affair? You merely lifted the screen, pushed it back to find the right angle, and then typed on the physical keyboard. Well, those days are long gone as it seems that laptops and tablets are fast becoming the same thing, and those touchscreen skills you earned using your phone can now be used on a much bigger screen, too. We check out one such hybrid example in the HP Envy x360. This sleek and powerful 15 inch Windows 10 laptop is essentially an updated version of the HP Envy 15 line that we reviewed right here some time back. Whereas as that was a pretty standard workhorse machine, with a non-touch screen and physical keys only, the HP Envy x360 kicks things up a few notches, both in terms of internal power and external flexibility. First up, the screen. The gorgeous FHD monitor, which boasts a very slim bezel, is affixed via two chrome-like hinges which allow it to rotate all the back onto the underside of the main body - 360 degree of sorts, hence the name. 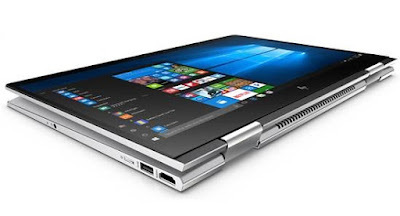 The hinges are stiff enough to let you leave the screen at whatever angle you want, allowing you to type normally, flip it over to an A-frame position, great for watching media, back further to invert the main body for a touchscreen only interface, good for Windows 10's tablet mode, and also folded right the way back to act like a tablet in its own right, with the keyboard deactivated. If you're thinking that a 15 inch tablet is a silly thing to behold, it's really not. 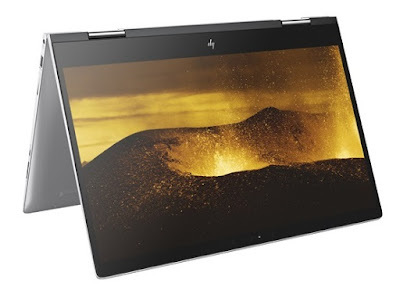 The HP Envy x360 is so slim (relative to other laptops, not tablets, mind) that it doesn't feel bulky n the hand, and in this mode you can comfortably, and enjoyably, use the included smart stylus. If you're an artist, or you prefer to take notes by hand on a digital device, this is great. The rest of the machine has been trimmed down since that HP Envy 15 review we did almost two years ago. 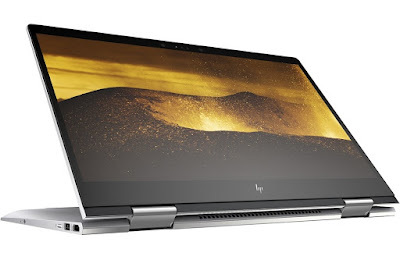 Ports are now limited to two USB 3.0, a full-sized HDMI (which just makes in in there), a headphone port, a SD card port, and a single USB-C. To be honest, compared to most other laptops, especially those that fold and flex, that is quite a lot, although we would've appreciated another USB 3.0. The physical keys are back-lit silver plastic, recessed into a sea of glorious aluminium. The whole case of the HP Envy x360, including the underside, is metal, which means it is a joy to handle, although not all that extra heavy. Inside HP has souped up a few things, too. 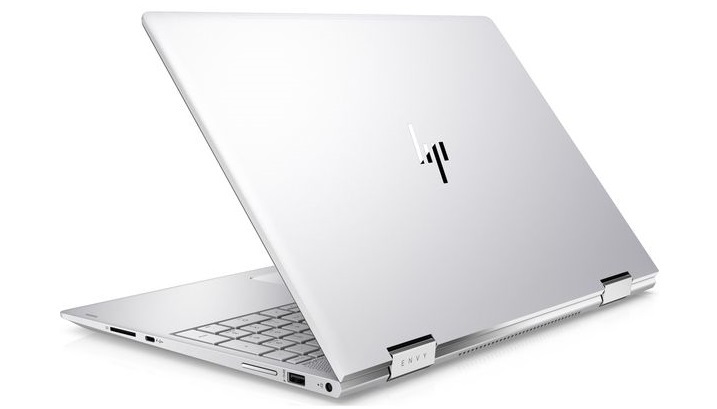 There are several versions available, with slightly different configurations of processors and RAM, but we were sent the model with the highest specs, the sexily named HP Envy x360 15-bp101na. For £1049 you get 8GB of RAM, an Intel Core i7-855OU processor, a 1TD HDD drive, as well as a 128GB SSD storage for running your apps and main programmes. The battery, so HP claims, will last up to 11 hours, but in use over the past month we averaged about seven hours of fairly intense usage each day. Still good, though. There are slightly cheaper versions, going down to £899, but the whole x360 line seems to be aimed more at experienced users who will appreciate that extra power and flexibility of use. After using it every day for a while now, we can honesty say that the HP Envy x360 is a solid and reliable bit of tech. Although it comes across like a business-only only Windows laptop - one that would look great sliding out of your briefcase as you sit down to a meeting - the folding screen and powerful internals means it will also suit creatives and gamers, too. This is fast, flexible, fun and finger-pleasing. Nice work, HP.